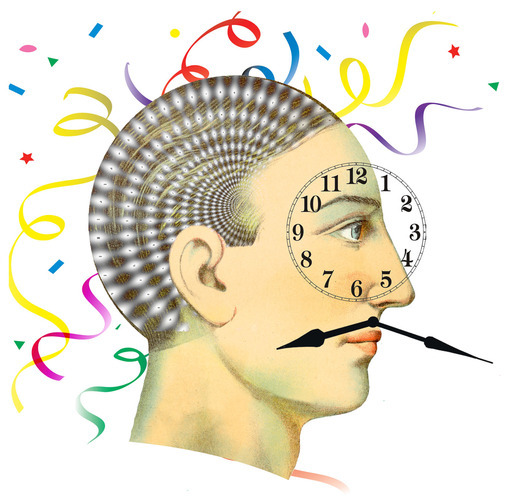 Interesting article from the New York Times on the how the brain processes time. While we might tend to think of time as linear and constant, that is not how we experience time emotionally, suggesting that our brains contextualize time differently than we conceptualize time cognitively. It did. Somewhere between trigonometry and colonoscopy, someone must have hit the fast-forward button. Time may march, or ebb, or sift, or creep, but in early January it feels as if it has bolted like an angry dinner guest, leaving conversations unfinished, relationships still stuck, bad habits unbroken, goals unachieved. “I think for many people, we think about our goals, and if nothing much has happened with those then suddenly it seems like it was just yesterday that we set them,” said Gal Zauberman, an associate professor of marketing at the Wharton School of Business. In fact, scientists are not sure how the brain tracks time. One theory holds that it has a cluster of cells specialized to count off intervals of time; another that a wide array of neural processes act as an internal clock. Either way, studies find, this biological pacemaker has a poor grasp of longer intervals. Time does seem to slow to a trickle during an empty afternoon and race when the brain is engrossed in challenging work. Stimulants, including caffeine, tend to make people feel as if time is passing faster; complex jobs, like doing taxes, can seem to drag on longer than they actually do. And emotional events — a breakup, a promotion, a transformative trip abroad — tend to be perceived as more recent than they actually are, by months or even years. Now researchers are finding that the reverse may also be true: if very few events come to mind, then the perception of time does not persist; the brain telescopes the interval that has passed. In a study published in the December issue of the journal Psychological Science, Dr. Zauberman led a team of investigators who tested college students’ memory of a variety of news events, including the appointment of Ben S. Bernanke as chairman of the Federal Reserve (33 months before the study) and Britney Spears’s decision to shave her head (20 months). On average, the students underestimated how much time had passed by three months, the study found. This was not entirely a surprise. In one classic experiment, a French explorer named Michel Siffre lived in a cave for two months, cut off from the rhythms of night and day and manmade clocks. He emerged convinced that he had been isolated for only 25 days. Left to its own devices, the brain tends to condense time. But the way it fixes the relative timing of events depends on memory, the new study found. To the extent that the students in the study remembered developments related to the original event — Ms. Spears’s complicated love life, say, or Mr. Bernanke’s interventions in the economy — that event seemed farther away. In a series of experiments, the researchers tested personal memories and memories of film clips seen in the lab. The pattern held up: the more intervening related developments came to mind, the longer away the original event seemed. “People have a hard time understanding the passage of time,” Dr. Zauberman said, “and in order to understand it latch onto something we do understand” — the unfolding of events. His co-authors were Jonathan Levav of Columbia University, Kristin Diehl of the University of Southern California and Rajesh Bhargave of the University of Texas, in San Antonio. In earlier work, researchers found a similar dynamic at work in people’s judgment of intervals that last only moments. Relatively infrequent stimuli, like flashes or tones, tend to increase the speed of the brain’s internal pacemaker. On an obvious level, these kinds of findings offer an explanation for why other people’s children seem to grow up so much faster than one’s own. Involved parents are all too well aware of every hiccup, split lip and first step in their own children; whereas, seeing a cousin’s child once every few years, without intervening memories, telescopes the time. On another level, the research suggests that the brain has more control over its own perception of passing time than people may know. For example, many people have the defeated sense that it was just yesterday that they made last year’s resolutions; the year snapped shut, and they didn’t start writing that novel or attend even one Pilates class. But it is precisely because they didn’t act on their plan that the time seemed to have flown away. By contrast, the new research suggests, focusing instead on goals or challenges that were in fact engaged during the year — whether or not they were labeled as “resolutions” — gives the brain the opportunity to fill out the past year with memories, and perceived time. Finally, the mind is perfectly capable of interpreting a fast-forward year, or decade, as something other than a frittering away of opportunities for self-improvement. In another series of experiments published in Psychological Science, psychologists found that when people were tricked into believing that more time had passed than was really the case, they assumed they must have been having more fun. The perception heightened their enjoyment of music and eased their annoyance at doing menial tasks. “One thing that social psychology taught us over and over is that the mind is a wonderful sense-making device, that it takes ambiguous or confusing information and simplifies it according to rules of thumb,” said Aaron M. Sackett, a psychologist at the University of St. Thomas in Minnesota who was the study’s lead author. A year like 2009 surely wasn’t all fun. But some of it surely was — and what better excuse for neglecting the dreary demands of self-improvement?